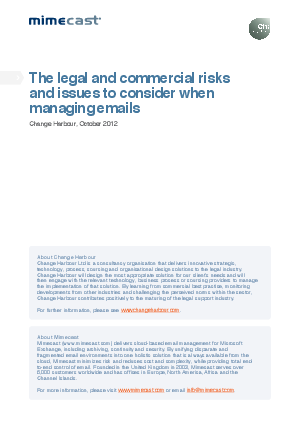 With recent high profile cases, such as the News of the World hacking scandal, hitting the news headlines, the issue of email retention has quickly moved up the IT Director’s agenda. Much soul searching has taken place as they ask themselves how easily they could retrieve email evidence if required to do so by a court of law. Growing e-discovery, compliance and knowledge management requirements mean that organisations must be more vigilant in demonstrating control than ever before. For law firms relied upon to advise clients in all business sectors this is particularly critical. Yet with such a large percentage of internal and external business communications performed via email, this is becoming an increasingly difficult task.